An international team of scientists has used the NASA/ESA Hubble Space Telescope to study the atmosphere of the hot exoplanet WASP-39b. By combining this new data with older data they created the most complete study yet of an exoplanet atmosphere. 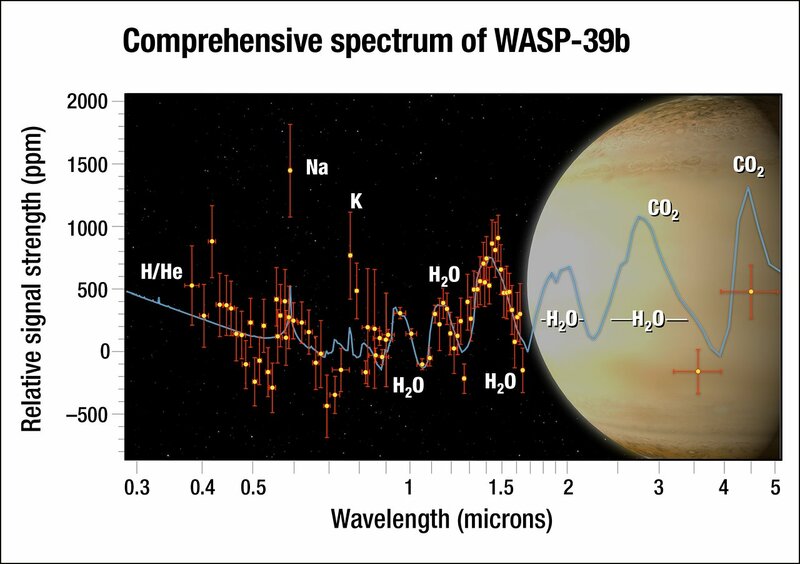 The atmospheric composition of WASP-39b hints that the formation processes of exoplanets can be very different from those of our own Solar System giants. Investigating exoplanet atmospheres can provide new insight into how and where planets form around a star. “We need to look outward to help us understand our own Solar System,” explains lead investigator Hannah Wakeford from the University of Exeter in the UK and the Space Telescope Science Institute in the USA. Therefore the British-American team combined the capabilities of the NASA/ESA Hubble Space Telescope with those of other ground- and space-based telescopes for a detailed study of the exoplanet WASP-39b. They have produced the most complete spectrum of an exoplanet’s atmosphere possible with present-day technology . WASP-39b is orbiting a Sun-like star, about 700 light-years from Earth. 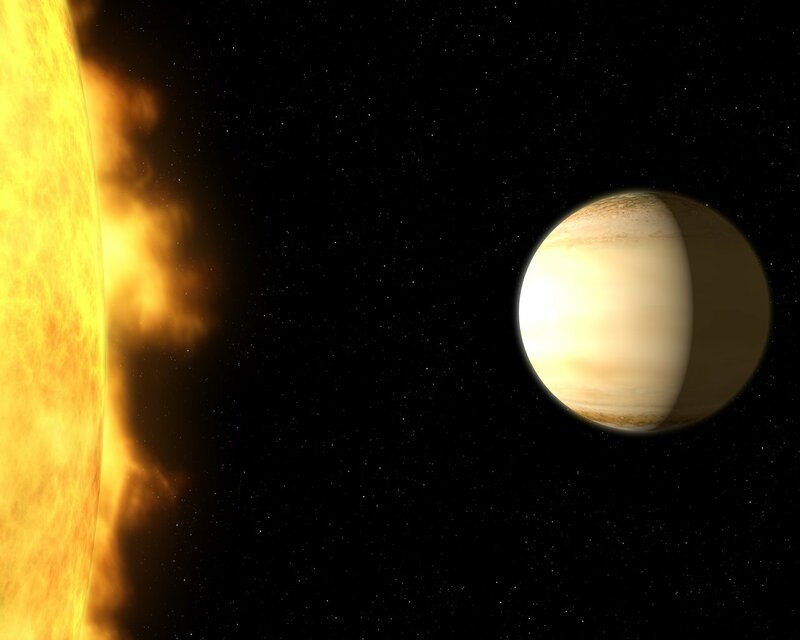 The exoplanet is classified as a “Hot-Saturn”, reflecting both its mass being similar to the planet Saturn in our own Solar System and its proximity to its parent star. This study found that the two planets, despite having a similar mass, are profoundly different in many ways. Not only is WASP-39b not known to have a ring system, it also has a puffy atmosphere that is free of high-altitude clouds. This characteristic allowed Hubble to peer deep into its atmosphere. By dissecting starlight filtering through the planet’s atmosphere  the team found clear evidence for atmospheric water vapour. In fact, WASP-39b has three times as much water as Saturn does. Although the researchers had predicted they would see water vapour, they were surprised by the amount that they found. This surprise allowed to infer the presence of large amount of heavier elements in the atmosphere. This in turn suggests that the planet was bombarded by a lot of icy material which gathered in its atmosphere. This kind of bombardment would only be possible if WASP-39b formed much further away from its host star than it is right now. “WASP-39b shows exoplanets are full of surprises and can have very different compositions than those of our Solar System,” says co-author David Sing from the University of Exeter, UK. The analysis of the atmospheric composition and the current position of the planet indicate that WASP-39b most likely underwent an interesting inward migration, making an epic journey across its planetary system. “Exoplanets are showing us that planet formation is more complicated and more confusing than we thought it was. And that’s fantastic!”, adds Wakeford. Having made its incredible inward journey WASP-39b is now eight times closer to its parent star, WASP-39, than Mercury is to the Sun and it takes only four days to complete an orbit. The planet is also tidally locked, meaning it always shows the same side to its star. Wakeford and her team measured the temperature of WASP-39b to be a scorching 750 degrees Celsius. Although only one side of the planet faces its parent star, powerful winds transport heat from the bright side around the planet, keeping the dark side almost as hot. “Hopefully this diversity we see in exoplanets will help us figure out all the different ways a planet can form and evolve,” explains David Sing. Data used to produce the full spectrum was also collected by NASA’s Spitzer Space Telescope and ESO’s Very Large Telescope. In addition older data from Hubble were used. When starlight passes through the atmosphere of an exoplanet, it interacts with the atoms and molecules in it. This leaves a weak fingerprint of the atmosphere in the spectrum of the star. Certain peaks and troughs in the resulting spectrum correspond to specific atoms and molecules, allowing scientists to see exactly what gases make up the atmosphere. Given the large amount of heavy elements in WASP-39b’s atmosphere, Wakeford and her team predict that carbon dioxide will be the dominant form of carbon. This could be measured at a wavelength of 4.5 micrometres with James Webb’s NIRSpec instrument. Such follow-up investigations would allow further constraints to be placed on the ratio of carbon to oxygen, and on the metallicity of WASP-39b’s atmosphere.